The Billy Bob Miley-Bob teeth were picked out by Miley Cyrus, they feature her favorite redneck themed Billy-Bob teeth. 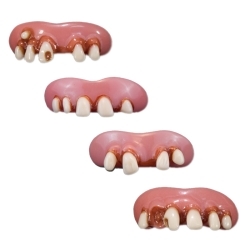 The Billy Bob Miley-Bob teeth come in four assorted styles; selection will be one of the assorted styles pictured. The Billy Bob Miley-Bob teeth include one set of false teeth uppers and impression material that creates a custom, secure fit allowing you to comfortably wear them for extended periods of time.